So what is Miss Pie's (Cake Fox New Toulouse)? This is a great chance to find out. There is a cool hunt called Death picks a winner starting today at New Toulouse. You get to be the main character in a murder mystery! What happened? Collect the clues to find out! You get gifts in the end, of course. 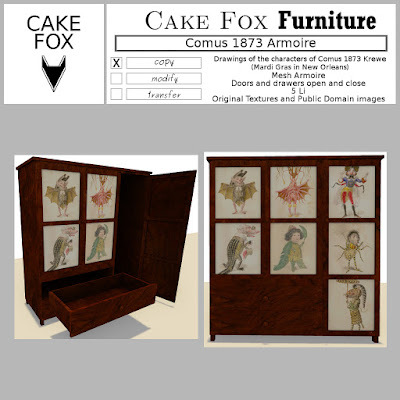 The Cake Fox prize is a Comus 1873 armoire, which is named after the drawings of characters for one of the krewes at 1873 Mardi Gras in New Orleans.